A doctor friend described to me the ‘minimum pricing of alcohol policy’ as ‘one of the few genuinely good public health ideas of recent years’. As with most policies that are good for public health but bad for big business it was quietly dropped. The coalition government instead opted to bring in a ban on ‘below cost’ selling of alcohol. A study published in the BMJ has, for anyone that had any doubt, put to rest any suggestion that the banning of selling below cost alcohol has any serious public health benefit and, significantly, has clearly restated the case for the introduction of minimum pricing of alcohol (as our progressive neighbours in Scotland have done – awaiting a legal challenge from the Scotch Whisky Association). The implemented policy of banning the selling of below cost alcohol was found to reduce harmful drinkers’ mean annual consumption by just 0.08%, around 3 units per year. Put another way that is just over one pint, per year, drunk less by harmful consumers of alcohol. In contrast, the study found that a minimum pricing of alcohol set at around 45p per unit would reduce harmful drinker’s consumption of alcohol by 137 units per year. In terms of pints that is approximately 60 pints less a year. We have known for a while now that the minimum pricing of alcohol disproportionately impacts on those of us who consume the most alcohol (in the study a harmful drinker was defined as the 5.3% of the population over 16 who on average consumer 58 units per week for females, 80 units for males). According to the study 2.2 million of us Brits are harmful drinkers (17.3% – 7.2 million are ‘hazardous’ and 61.5% – 22.5 million – are ‘moderate’). The study found that 30.5% of harmful drinker’s alcohol would be effected by a minimum price of 45p per unit while just 19.5% and 12.5% respectively for hazardous and moderate drinker’s alcohol would be effected. In short and written another way, the coalition’s decision to delay the introduction of a minimum price of alcohol is costing Brits 610 needless deaths a year and a whopping 23,200 hospital admissions. Something worth bearing in mind next time you go into an overworked hospital. I have today written for ehospice about 4 year old Abdurahmane who featured on Channel 4’s ‘Unreported World’ documentary who has sadly passed away just a few days after the powerful documentary was shown. Like so many that heard his story I am really sad to have heard this news. I am writing now to encourage you to watch this Channel 4 documentary that looks at access to basic pain medications in Senegal. Abdurahmane has passed away but I hope his death, as his life was, might be part of what brings about the change so desperately needed in many countries around the world – by no means just Senegal! The life of 4 year old Abdurahmane touched the lives of millions. 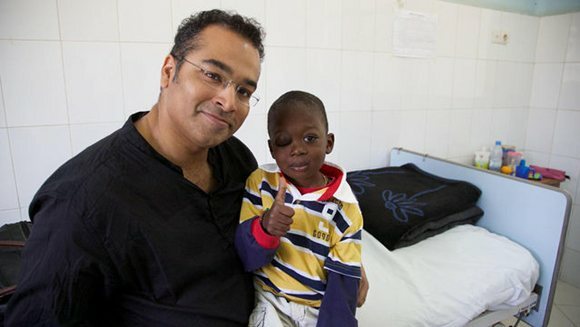 Abdurahmane had retinal cancer and featured on Channel 4’s ‘Unreported World’ documentary looking at shortages of pain medications across Africa and specifically in Abdurahmane’s home of Senegal. At the time of filming the documentary he had been in the hospital for three months, receiving chemotherapy, which had shrunk the tumour in his eye. Abdurahmane had also been one of the few people in Senegal to receive morphine to control the pain he was in. The documentary explained that when stocks are low, the hospital pharmacy gives children priority to the morphine. Sadly though, even in this specialist unit the stocks of morphine sometimes run out. Human Rights Watch last year highlighted that the authorities in Senegal allow only a very small amount of morphine into the country each year. It is thought they import as little as just one kg, enough to treat about 200 cancer patients when there is demand for tens of thousands of patients in severe pain. It was through the story of Abdurahmane though that this problem was highlighted to the millions of viewers around the world who would have by now watched the documentary. It was with great sadness then that a few days after the programme first being shown we learnt of Abdurahmane death. The impact that Abdurahmane had on the viewers was immediately obvious in the string of responses from memebers of the public. @krishgm Sad and awful news. Have thought of him so often since your powerful piece. RIP. @krishgm Sorry to hear that Krishnan. Heat breaking story but very important that you reported it. @krishgm how awful. Thoughts are with his family. The @UnreportedWorld was a brilliant piece of journalism. Let’s hope it creates change. It is hoped that Abdurahmane life and death will continue to inspire and will drive the change in Senegal that is so desperately needed. You can watch the documentary for a limited period on the Channel 4 On Demand facility by clicking here. This article was originally published in The South African. Whilst wishing Mandela a full recovery we can, and indeed must, use this opportunity to talk about the importance of palliative care – a taboo across much of the world including most of Africa. People from across the world have come together to wish Mandela a recovery from his latest lung infection – a legacy of the tuberculosis he suffered from when he was imprisoned on Robben Island. Prayers have been said and fingers have been crossed as anxious individuals wait for next bulletin of news to come from Pretoria’s Mediclinic Heart Hospital. The WHO estimates that about 1% of the Africa’s population requires palliative care – this is approximately 9.67 million people across the continent – approximately half a million of whom live in South Africa. Russia is leaving cancer patients to die in pain – where is the outrage? An edited version of this article appeared in Liberal Conspiracy – the UK’s most popular left-of-centre political blog. In Russia cancer patients are left to suffer and ultimately die in pain with inadequate access to basic pain control drugs such as morphine. When one doctor defied the state’s overly restrictive laws, she was arrested. It is time for the healthcare community to speak out. Dr. Khorinyak allegedly wrote out two prescriptions for the pain relief medication tramadol. The prescriptions were for Victor Sechin, a terminally-ill cancer patient. In the eyes of the Russian state, the medical practitioner of more than 50 years broke the law. Indeed, Russia’s overly restrictive laws regulating access to morphine have been the focus of on-going criticism for a number of years. Simply put, palliative care is a human right. In Russia though, 450,000 people are diagnosed with cancer every year resulting in more than 2.5 million people suffering from the disease. Russia not only has a clear moral obligation to support these patients but also a legal human rights responsibility as well – one that it is currently neglecting. With the noble exception of ehospice and a handful of other professionals, few have spoken out. The Russian government is standing by while thousands needlessly suffer. When one person does speak out, she is prosecuted as a criminal. It is time for health care professionals from around the world to stand up for Dr. Khorinyak and speak out, not only against her prosecution but also against Russia’s wider neglect of patients in need of pain relief. The Government has today announced its measures to try and tackle the health problems related to smoking tobacco. They have launched a paper called “Healthy lives, healthy people: A tobacco control plan for England” which includes their desire to ban displays of tobacco products. There are some problems related to smoking tobacco that cannot be ignored. Over 80,000 people die in England each year from smoking related diseases, that’s more than all deaths from alcohol, road traffic and other accidents, suicide, illegal drugs and diabetes combined. Smoking causes 18% of all deaths in those aged over 35. Smoking is estimated to cost the NHS in England £2.7billion per year, or more than £50million per week. Seven out of ten current smokers want to give up smoking and six smokers in ten make an attempt to quit each year. These facts speak for themselves to illustrate the problem. Yet, this move, although welcomed by health groups have been met with a barrage of criticism. One of the biggest concerns about the display ban is about the effect it will have on small business, but I think the government has tackled this issue by delaying the implementation date for small shops. This gives them time to adapt to what is essentially quite a small change. Equally, people have highlighted this move as the “nanny state” trying to control or restrict individual freedoms [to do self harm]. Yet again, this argument does not seem to hold up, as there is no proposed ban on the purchasing or selling of these products, just that you will have to ask for them rather than be able to see them. The logical conclusion however is that shops should be forced to ban the display of all harmful products (saturated fats, alcohol…where does it stop)? From 14 % to 11% or less among pregnant mothers. If it manages to reduce smoking rates as the government officials suggest then I fully support this ban. I cannot help but to think that the downsides of this ban are the last cries from an embattled industry. I do not think it is threatening our civil liberties. I do not think it will be the reason why small businesses go out of business. But I do think it may just help some of those thousands of people who are trying to give up smoking succeed. For all those who don’t want to give up – you don’t have to. You are free to carry on smoking! Booze Britain – The new Beer Barron! Today the Barron’s report on how to tackle the UK’s drinking problem (which one?) was released with much media fanfare. Kevin Barron (the Chair of the Health select committee) proposes in this report two main policy idea’s on how to tackle “Booze Britain”. Idea Number One, he suggests a minimum charge of a 50p per unit of alcohol. Idea Number 2, he suggests a reversal of the 24 hour licensing that came into effect in 2003. 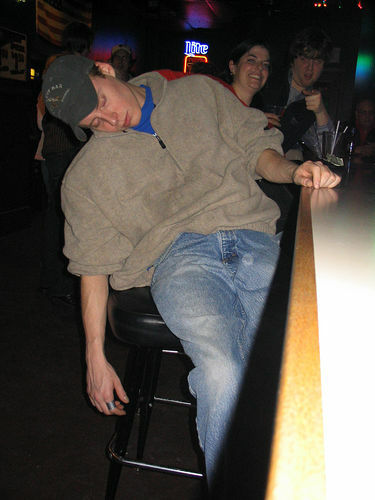 Firstly, let’s get it on the record, that I, steve4319 think that Britain has a serious alcohol problem. We can see hundreds of drink drive related deaths per year, billions of pounds spent annually by the NHS on alcohol related illnesses and this is without mentioning the personal horror stories that many have witnessed from alcohol abuse and dependency (note they are two separate things but are often confused). Something has to be done. Yet, this piece of social policy seems about as sensible as downing a tequila slammer just after “bottle rocketing” some stellar (believe me it doesn’t end well). Let’s take the proposed 50p minimum charge for a unit of alcohol. This would mean that you could still get 1 pound pints, 50p shots of vodka and (if so wished) a 50p shot put into the top of a pint of larger (yes this is common practice in Weatherspoons up and down the country). Essentially, it would not tackle those slightly disgusting scenes of fully grown men vomiting on each other’s shoes in the early hours in town centers. It would not stop the cat fights that break out between inebriated girls. Most importantly, it would not put a dent in the business plan of J.D Weatherspoons of “buy cheap, sell cheap”. What it would do is hit the supermarket drunks. It would hit those who buy bottles of wine (it would mean each bottle would be at least 4-5 pounds), those who buy crates of beer (your looking about 24 quid a case) and the bottles of spirits (for a 70 cl bottle expect to pay at least 14 pounds) – assuming I have done my math’s right! When I use the phrase supermarket drunks, you imagine a homeless guy with a can of special brew…think again. The supermarkets are being hit by a respectable wave of middle classes consuming incredible amounts of alcohol. It is a hidden face of alcohol abuse in the UK. Your doctor, your teacher and the nice man in the bank are probably going home every other evening and consuming a bottle of wine (each). OK, they do not end up urinating on war memorials but they are still doing serious damage to themselves. So, I hear you cry…surely if this 50p a unit idea helps tackle this, it must be a good idea. I will explain why it is not on two levels. Firstly, this catch all policy disadvantages the majority to help the minority. As a rule of thumb that is not a good piece of social policy. It depends though, how much it disadvantages some in relation to helping others. In this case, due to the middle class nature of those it intends to help, it would not significantly help those it is aimed at. On the other-hand, it will hit the poorest section of our society that spends literally a few pounds a week on alcohol. It will not affect all you who appreciate a good 2001 Rioja, but it will affect those who appreciate the 2.99 specials! Secondly, I wish to question whether it is up to the state to moderate self-harming practices (which is different to public issues such as town centers on Friday nights). Most ordinary people would not advocate complete prohibition (enjoy it in moderation blah blah), but feel as though alcohol can, and should be enjoyed in moderation. In a free society should this balance not be left to the individual to reach? While 3 pints of beer is considered (including by Her Majesty’s government) to be “binge drinking”, I would personally consider it a good night down the pub! On the other-hand we can see that 3 pints would leave some people on the floor. I think that alcohol consumption should be like other aspects of adult life where we learn (through experience and advice) how to live as functioning people. In the past I have drunk too much too often, now I only occasionally drink too much – job done. This however, has to be accompanied by sufficient support mechanisms (provided by the state) to help those in need with serious problems (that represent the minority). This idea of the state trying to force people to drink less through economic sanctions is surely mislead. There is then the issue of the reversing of the 24 hour licensing law! I still feel that one of the main problems with drinking is the associated problems (the vomiting on each other’s shoes scenario, the street fights etc). The staging of club dispensing is a good thing in terms of public order. There is nothing more terrifying than looking down a high street (sober enough to remember it) at 2-3 AM on a Saturday morning. It makes the police lives easier if they can focus on a hand-full of establishments at a time. Equally, the strict licensing times do not tackle the core of the problem, why people are drinking themselves unconscious every Friday and Saturday night (and causing all the health implications). The idea of not being thrown out of a pub at 11 is a great idea. We no longer live in an era when we have our supper at 6:30 and are in bed by 11. I think by opening later, the bars and clubs are simply reflecting this. To suggest that by limiting the amount of time people have to drink that they will drink less is ludicrous. We can see the real problems starting when people are restricted in the amount of time they have to drink (the “downing culture”). Indeed, we can see through examples across Europe, that it is not the opening hours that are the issue; it’s the “way” we drink. • The round system – our stingy nature means that if you buy one drink, you basically commit yourself to four (or five or six) to get your “money’s worth”. Also, the rounds get purchased at the rate of the fastest drinker. Due to the Brits inability just to chat, we have to have a distraction (a drink to slurp). The moment your glass is empty you have to utter those magic words “another drink anyone”. If you say no – you lose! • The pint culture – by the very nature of drinking 568 ml of beer in a sitting (compared to the 250 or 330 norms in most of Europe). • The 7:30 culture – we start a lot earlier than most of Europe, and now we no longer stop much earlier. We are effectively drinking for 7-10 hours often! • The strange green thing on the top shelf moment – thanks to advertising and a serious commitment to getting off our faces we regularly think it is a good thing to buy a “round” of those bright green things that taste like a strange mixture of toothpaste and apples. The Brits are famous for it…we always have been. But how do we try and enjoy it rather than abuse it?